Laurent Nuñez, secretary of state to the Interior, has called for “general responsibility” and said he “hopes for fewer protests” in the wake of the Strasbourg tragedy. Two people died, with one person in a vegetative state and 12 others injured, after shooter Chérif Chekatt opened fire in the Strasbourg city centre near the famous Christmas market two days ago. Mayor of Nice, Christian Estrosi, whose city suffered in the terror attacks of 2015, said that police should be allowed to focus on keeping French people safe, and not on marshalling Gilets Jaunes protests. Speaking on Europe1, he stopped short of saying that President Emmanuel Macron should explicitly "ban" further protests, but added that the country could be at risk of more terror attacks before the end of the year. Mr Estrosi said: “The law enforcement forces are exhausted, and are now focused on the threats we face. I call on the responsibility of each person. The Gilets Jaunes movement can only grow if it calls on itself to face this responsibility. #GiletsJaunes : pour @cestrosi, il faut empêcher le rassemblement de samedi sur les Champs-Elysées en raison de la menace terroriste. "Il ne peut pas y avoir un acte V qui fasse prendre des risques après #Strasbourg"
Vice president of the Les Républicains party, Damien Abad, said: “A ceasefire should be imposed, out of respect to the victims’ memory, and because our law enforcement officers are mobilised. 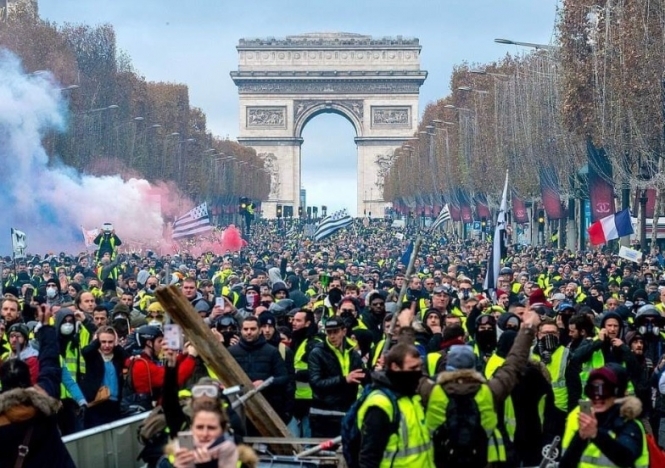 The calls come after a 23-year-old protester was killed in a Gilets Jaunes protest in Avignon (Vaucluse, Provence-Alpes-Côte d'Azur) last night (Wednesday December 12 to Thursday December 13), after being run over by a heavy goods vehicle on a roundabout just after midnight. He is the sixth person to die as a result of the Gilets Jaunes protests, which began on November 17. The driver of the vehicle is in police custody. Caroline Armand, vice-prosecutor of Avignon, confirmed that the driver is of Polish nationality and does not speak French, so is awaiting the arrival of a Polish-French translator before he can be questioned by police. Early reports say that he believed the protesters were becoming aggressive, so he accelerated to get away from the crowd, accidentally running over the victim.